The construction of another new flexible OLED fab may not be necessary from a supply/demand perspective, or is it just the desire of regional or local Chinese governments to grow employment and (hopefully) regional revenue? We previously reported that the Kunshan government had funded Black Cattle Foods as they build out their Gen 6 flexible OLED fab. The Municipal People’s Government of Kunshan recently added another 1m yuan ($159k US) to their coffers (and $79k to Visionox (pvt) who is building the fab). But not to be outdone, the Kunshan Development Zone committee also granted 52.8m yuan ($8.3m US) to the project as a subsidy “to construct or otherwise form a long-term asset”, and while we have lost track of the funding to date, we note that the project seems to have no difficulty getting financed. Some industry proponents have indicated that the Chinese government has moved away from the display space and will reduce funding in lieu of its ‘new’ focus on the semiconductor industry, yet at the regional and local level it seems little has changed and money seems to be flowing freely. With the growth in OLED supply and the offset caused by lower than expected iPhone X sales, new OLED fabs could face difficulty becoming profitable, the ‘new’ administration, could look for a way to defer any additional funding and the fab will languish, eventually being combined with other local projects that are restructured. Panel producer Tianma has been restructured a number of times and panel fabs in Japan have been restructured and combined by the government a number of times (Japan Display is a result of one of those combinations/restructurings). The Black Cattle OLED project was first announced in September 2016 and seems to have the ability to encourage a myriad of local and regional government agencies and funds to finance the project. Some industry proponents have indicated that the Chinese government has moved away from the display space and will reduce funding in lieu of its ‘new’ focus on the semiconductor industry, yet at the regional and local level it seems little has changed and money seems to be flowing freely. Our concern however, is not the funding, but the profitability of such ventures, and the longer-term impact on the industry. At the onset, everything looks perfect, construction crews are employed, roads are built, and overall jobs are created, but two questions remain. First, will the company that manages the plant be able to garner a profit, or is this a moot point? The politicians that are approving the funding will be involved for a while, but will likely move up the political or Party chain in a year or two and will no longer bear the responsibility for the project. If the fab faces difficulty becoming profitable, it will then be the responsibility of the ‘new’ administration, which will look for a way to defer any action until they have moved on, and the fab will languish, eventually being combined with other local projects and restructured. Panel producer Tianma has been restructured a number of times and panel fabs in Japan have been restructured and combined by the government a number of times (Japan Display (is a result of one of those combinations/restructurings). Second, and this is a more ephemeral point, is the construction of another new flexible OLED fab necessary from a supply/demand standpoint, or is it just the desire of regional or local Chinese governments to grow employment and (hopefully) regional revenue? If we logically look at the display space currently, and even on a long-term basis, we see a number of maturing segments such as TV, smartphones, laptops, enmeshed with a number of technological changes that can shift the players significantly, but will not materially change the maturity level of the industry. Yes, we could have a significant breakthrough in holography that would change the way we see content, or AR contact lenses could provide 24/7 personal entertainment or data, but another flexible OLED fab, at a cost of almost $4b, just to encourage growth in a province or city seems counterproductive. That said, we are realists, and realize that the goals of a few are not always looked at on an industry wide or global scale, and such projects will continue to get funded until money becomes tight or they start to fail. But as to the necessity for another flexible OLED fab, one might ask the management of Samsung Display, who is struggling to fill its A3 fab capacity until Apple returns, for their perspective on the issue. ​TV, smartphones, laptops support the current capacity growth? There could be a significant breakthrough in holography or light field technology that would change the way we see content. But the applications for these technologies tend to be VR/AR, which are near eye constructs and are small devices 1” to 2” so they won’t contribute to the display area calculation. DSCC provided some insight into the question of new capacity when it published its report on current and forecasted Display Capex. 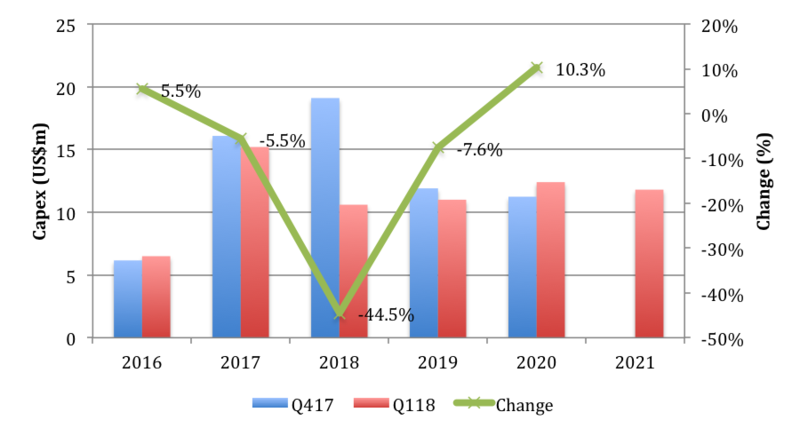 DSCC forecasted in Q417, OLED Capex from 2016 to 2020 would be US$64.5b, but just 1 quarter later they reduced the forecast to US$55.7b a 13.6% drop. Most of which occurs in 2018, which is down 44.5% vs. the Q417 forecast. Some of the reduction is made up in 2020, where Samsung and LG have deferred the capex. However, the 6th Gen capacity growth could also be just as easily cancelled if demand doesn’t grow fast enough.